The Sulphur-Crested Cockatoo (Cacatua galerita) is one of the big species of cockatoos. There are some species that look almost exactly like this one, but those are smaller in body size. The Sulphur-Crested cockatoo has white feathers, a yellow crest, yellow feathers under the wings and a black bill and black feet. Even when the crest is put down, it is still visible. The feathers of the crest are pointy and loose-fitting. This species of cockatoo has four subspecies, each occurring in a different habitat and being distinguished by subtle differences. The subspecies can be interbred (not recommended), making it harder to determine the species for people looking to find this information. On this picture you can see the difference between a Sulphur-Crested cockatoo (Cacatua galerita) (right) and a Lesser sulphur-crested cockatoo (Cacatua sulphurea sulphurea). These are entirely different species. The Sulphur-crested cockatoo occurs in Northern and Eastern Australia and New-Guinea. They live in the forests, especially on the edges. They are also common in urban areas. There are four subspecies of the Sulphur-Crested cockatoo. A subspecies is a group that is considered part of a species, but differs in certain traits. Usually the subspecies occurs in a different location with almost no contact between the subspecies and the species, e.g. on islands. Mating the species with one of its subspecies will yield fertile offspring, but it is not recommended to breed them in this way because the distinct traits of the subspecies will be lost. The subspecies of the Sulphur-Crested cockatoo (Cacatua galerita) are the Mathew’s sulphur-crested cockatoo (Cacatua galerita fitzroyi), the Triton cockatoo (Cacatua galerita triton) and the Medium Sulphur-crested Cockatoo or Eleonora cockatoo (Cacatua galerita eleonora). 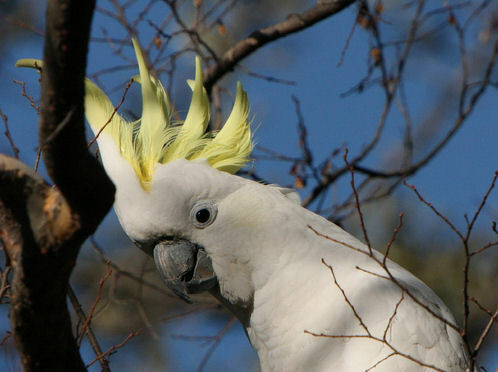 All subspecies can be kept as pets, but they are more rare than the ‘normal’ Sulphur-Crested Cockatoo Cacatua galerita galerita. In appearance and behavior the subspecies are almost the same. The Lesser Sulphur-Crested cockatoo (Cacatua sulphurea sulphurea) looks similar to the Sulphur-Crested cockatoo, but is a completely different species. They can not be interbred. They occur on different continents. Because of the size and intelligence of this species of cockatoo, it is less easily kept as a pet than the smaller species like the corella’s. Sulphur-Crested cockatoos can produce an insane amount of noise and need a very large cage. This makes them less suitable to be kept in a house. They do very well in an aviary with other cockatoos of their species. Usually this species is found in bird parks, zoos and breeders and not so much in people’s homes.